Sketch Fridays #32 – Zion. My wife and I recently celebrated our 6th wedding anniversary, kind of. As esoteric as it may seem, the fact that our nuptials are celebrated every year is a nice bonus but is not why my wife and I celebrate on that day since our wedding was, in a sense, our 10th anniversary gift to ourselves. We dated for ten years before getting married, and when we did so, we got married on our dating anniversary. So, instead, we actually recently celebrated our 16th anniversary together (we legitimately got married on our 10th anniversary––to the day), and to do so we did a pretty epic trip through a few of our nation’s most treasured natural gifts. Our trip was catalyzed by the fact that my wife had never been to the Grand Canyon. I had been twice, but will admittedly reveal that I never really appreciated what I beheld. Part of that makes sense, especially upon this most recent trip––it’s hard to comprehend the vastness before you as you stare into miles of emptiness carved into the earth. I am afflicted with near-sightedness, for which I wear corrective lenses. At many points during our trip, I realized that when I removed my glasses, I could still absorb these vistas with astounding clarity. The one thing I was hoping for, though, was understanding. However, even with my glasses off, the simple act of comprehending such grandiosity didn’t process fully, but more so than before. At some point, I just felt like I was staring at a photograph. 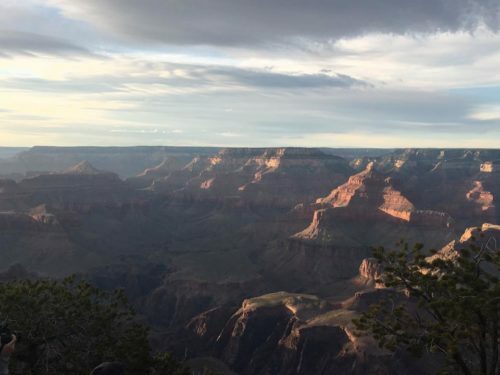 The Grand Canyon––as well as Zion National Forest and Bryce Canyon––is so vast that, for whatever reason, its depth evades my perception and, at some point, I’m marveling more at what I know is in front of me rather than what I see. Sunset at the Grand Canyon. 2017. Our trip amounted to a big loop. We flew into Las Vegas and drove up to Zion for a few days before hitting Bryce and the Grand Canyon. After those landmarks, we cooled our jets (kind of ) in Sedona before heading back to Vegas to fly home. Overall, it was a satisfying trip and we did a lot, but that first night in Zion encapsulated the scope of what the ensuing week would hold for us, albeit unknowingly. Our hotel was walking distance from Zion’s entrance. We had a back patio that overlooked an outer Zion wall and even just sitting from the comfort of a hotel patio the scale overwhelmed me. I tried to draw it and the limits of the page kept me from being wholly satisfied. 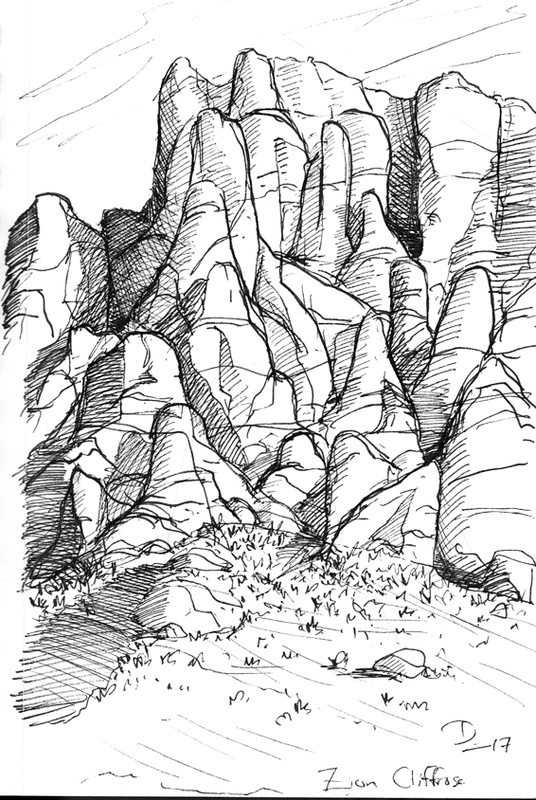 It’s only in hindsight, going to look back at the sketchbook, that I can see––in my estimation––the grandiosity of what I saw translated into sketchy pen marks and rudimentary shading.